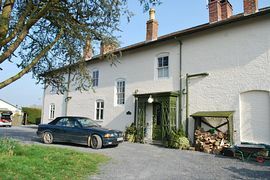 Situated on the edge of Guilsfield and 2 miles from the market town of Welshpool. Local attractions include Powys Castle, Welshpool Canal Museum, Llanfair Light Steam Railway and Lake Vyrnwy. The house is adjacent to the owner's Derwen Garden Centre (a branch of the renowned Dingle Nurseries) and holiday tenants will be granted a 10% discount throughout the centre, including the licensed restuarant. The house has 3 bedrooms, one family one double en-suite and one twin. 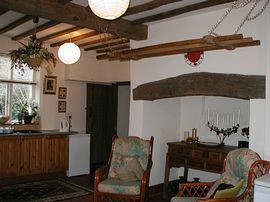 It has a large kitchen diner with beamed fireplace. 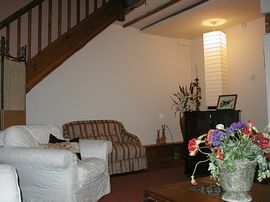 A large living area with comfortable furniture and french doors leading into the garden area. 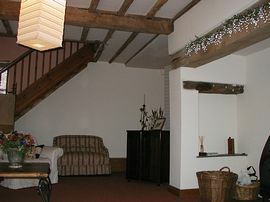 There is an extra shower room and toilet on the ground floor. 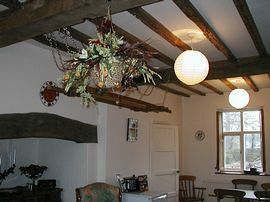 Local Services: 2 excellent pubs close by in Guilsfield which also has shop, post office ,church. Welshpool 2 miles for supermarkets leisure centres etc. After 1 mile you will see a sign for Guilsfield and Derwen Garden Centre on the right. Turn here and the houses are the first on the right. The keys can be collected from the Garden Centre. Awaiting grading has achieved 4 stars in the past.